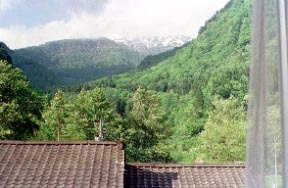 A hakusan, the wooden Japanese style Ryokan of the time-tested product [ mountaineer ] as an isolated lodge of the Ichinose trailhead.The quiet natural environment and dish in which a net income ravine flows into a hill at the back across a hakusan observatory and a road boast.Staunch dish of wild plants if it is talking about the stay privilege, like the plan "I deliver wild grass at the addressee's house" will come out! In addition, the heart of hospitality has been transmitted in the prepared.It is said that the hot spring of a weak hot brine spring in which there is a wooden smell is effective against recovery from fatigue.It is a hot spring to enjoy very much before and after mountain climbing. He stays after 2012-10 -25 visited again and hakusan mountain climbing. There is a method of preservation which gets across to this ground for a long time in order to harness the rich and precious wild grass which the forest of the beech of a hakusan will bring about without the place left carefully, and the dish way is an enough.Then, the climax Aralia cordata on a par with a table has [ luster and color or mouthfeel ] wonderful local culinary specialties, such as an excellent piece and an abacus (chunk pickles in vinegar) of char.One was taken, before the smell of the cooked in a pot of the homemade three-year miso which used the garlic excited appetite and took the seat. 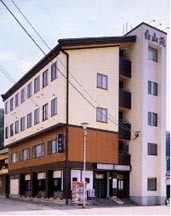 It is a good location to see about a new building guest room to hakusan Mt. Syaka (2053 m). 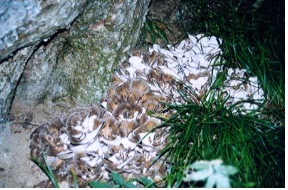 I will take out, if it can take from the natural maitake-mushrooms and end time of summer! Please enjoy a sister-lodge "Shiramine hot spring and hakusan garden" at hot spring in winter.A dish is the same prejudice as a Nagai. Wild grass and fresh water fish cuisine.7 - an August are mountain-climbing dishes. Tempura.He is surprised at the rainbow trout thick slice of a lid piece, and it is !. Even if char looks at a dish grilled with salt, it is excellent in a material with a right model. The volume of が however TSUMIRE whose delicate technique was effective, and moveable cooking stove use, homemade three-year miso, and the smell of an appetite stimulate garlic! Climax Aralia cordata and a char abacus are excellent pieces. Local wild grass is taken and saved by employee full force.Also those who shoulder about 100 K.
They are - Shiramine Hardened-tofu sliced raw fish, nameko mushroom taking down, and fruit natural Japanese horseradish plug immersed and a carp, or the raw fish slice cooled in a water and sweetfish of char dish-grilled-with-salt - Wipes, and, as for the tempura and climax Aralia cordata of food simmered in broth and char, or wild grass, lend each other. Separated by gender.A Log structure, two bathtubs, the fountainhead and heating circulation. To a day, 7 and an August are 3-4, and is one in autumn.